Mountainwood estate sits on over 6.5 acres of scenic grounds in the exclusive Uplands at Snoqualmie Valley. Best practice construction and engineering by Design Guild Homes combine sublime luxury, tomorrow’s technology, opulent amenities and groomed outdoor spaces to create an enclave that offers both privacy and a profound connection to nature. Main-floor master suite, theater, wine room, solar panels. 6 car garage and outfitted shop make an ideal home for the dedicated collector or creator! Mountainwood is a majestic lodge-style estate that occupies over 6.5 acres of scenic grounds in the exclusive Uplands at Snoqualmie Valley development, just outside of North Bend at the gateway to the Cascades. 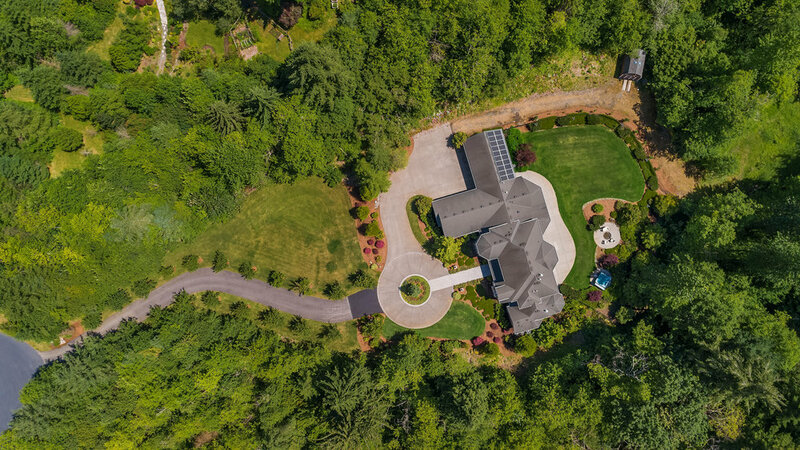 The property is comprised of a grand main house with groomed and landscaped outdoor spaces that mesh beautifully with surrounding forestland to create a residence of sublime luxury and profound connection to nature. The house is approached via a gracious circular driveway that lands directly in front of its wide and covered front porch. It presents a stately and welcoming façade, clad in natural stone and shingles, with numerous dormers and turret features for added character. A lush selection of native plantings around its foundation helps seamlessly blend the home into its surroundings, while careful siting ensures a tremendous sense of privacy and tranquility. Walls of windows flood the house with natural light and frame stunning outlooks over the gardens, woods and visiting wildlife. Mountainwood is a completely custom property, designed by and for a demanding engineer to exemplify the state-of-the-art in building, energy and comfort technologies. It will provide years of opulent, efficient and low-maintenance living to its new owners, thanks to a tremendous amount of effort and expense that was invested in its construction in 2004, and which continues in the form of meticulous maintenance and updates to this day. Every detail of construction from the house’s web-enabled solar array to its discreet, zoned HVAC systems to its industrial-level shop and garage spaces has been optimized to provide the infrastructure for an eminently comfortable, reliably connected and secure lifestyle in the country. The house offers 4 bedrooms and 4.5 baths in over 4700 square feet of elegant living space, with an open and expansive floor plan that covers three levels – two above grade and one below. It is comprised of two wings, connected by an expansive great room, with a gracious master suite to the right, and kitchen, office and dining areas to the left. A grand staircase just off of the foyer links all three levels together, and leads upstairs to a wide balcony landing that overlooks the entry and great room. This dramatic architectural feature separates two additional bedrooms that share a bath to the left with an upstairs guest suite on the right. The lower level contains a massive dedicated media room, a wine cellar with cigar lounge and tasting room, a half bath and storage. In addition, the property includes two oversized, three-bay garages, both of which are carefully tucked to the side of the property so as not to distract from the home’s formal architecture and presence. Classical detailing abounds throughout the interiors, with columns, crown molding, intricate trim and wrought iron used to define a series of graciously scaled rooms, while a timeless palette of surfaces includes custom tile, hardwood and natural stone. The ceilings on all levels are extra tall, with matching door apertures and windows for an airy sense of volume in every section of the house. A dramatic foyer spills forward under a second floor balcony and directly into the vast two-story central great room, with its wall of windows overlooking the back yard. This voluminous space is anchored by a river rock fireplace and illuminated by low voltage lighting on dropped track for an enhanced sense of warmth and intimacy, and is attached to the gourmet kitchen by an open dining area with French doors to the patio. A large office sits to the left of the entrance, and looks over the front yard and the porch through bay windows built into the turret in which it is housed. This home business center is richly appointed in cherry wainscoting and built-ins, and features high-speed networking to facilitate virtually any professional need. The kitchen is a gourmet’s delight, with custom cherry cabinetry, slab granite counters and custom tile backsplashes. The appliances include a 48” SubZero refrigerator, a Viking gas range with double ovens, 4 burners, a griddle and grill, as well as a matching high-cfm hood and Maytag dishwasher. An island is the ideal place for casual dining and conversation during meal preparation. The kitchen, main hallway, entry and dining area are all paved in diagonal porcelain tile for easy maintenance and lasting durability. A grand hallway leads between the office and kitchen past the walk-in pantry, a large laundry room and a marble-lined powder room as it progresses toward the house’s primary mechanical control room, on the way to a secondary garage and shop area. Every system that provides comfort, safety and utilities to the house has been meticulously designed for robust performance and reliability. Each floor has its own dedicated, web-enabled HVAC system for maximum efficiency, the whole house is wired for back-up power generation, and fire suppression and monitored security systems ensure enhanced safety and quick response. A reverse-osmosis water filtration system provides high quality drinking water, while a fully integrated sound system and wiring for both cable and satellite television afford plenty of entertainment options. A cozy tasting room and cigar lounge leads to the house’s 833 bottle wine cellar. This specialized smoking room features an advanced air replacement system to keep smoke and odors from circulating throughout the house, with preheating to ensure comfort. The wine cellar is entered through a hand crafted arched doorway that is matched by a barrel vaulted ceiling and redwood paneling and racking. It is conditioned by a Cellar Pro system that ensures optimum temperature and humidity for long-term bottle storage. Finally, a convenient powder room and a lower-level mechanical room with high-efficiency HVAC systems, structured computer and cable wiring systems and property monitoring cameras complete this subterranean level. To the right of the great room sits a private and opulently scaled and appointed main floor master suite. 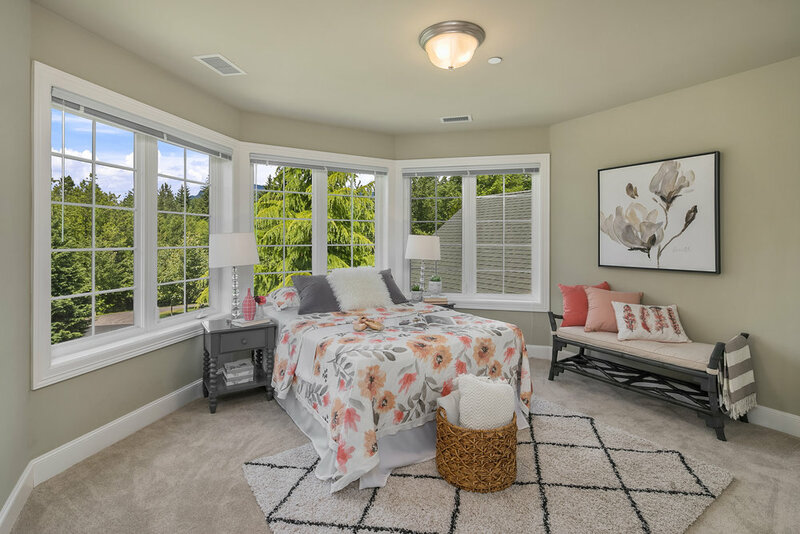 The bedroom features oversized windows that frame gorgeous views over the back yard, while a French door leads directly out to a private patio and hot tub for convenient relaxation. A turret in the back corner of the house provides a sun-drenched seating area with a large bay window, and an ornate fireplace imbues the room with warmth and architectural detail. A pair of huge walk-in closets leads the way into the master bath. This calming retreat sits beneath a tray ceiling and is anchored by a deep soaking tub with marble surround. A spacious vanity sits on either side of the tub, each with marble counters and plenty of storage. A private water closet and a walk-in marble shower with seat complete this sumptuous spa. Upstairs, a spacious guest suite offers beautiful garden views from its bay window wall, and includes an elegantly appointed ensuite bath and walk-in closet. With plenty of storage and a location in its own wing of the house, this is a delightful and private enclave for long-term visitors or extended family. The second floor balcony leads to the other side of the house where two additional bedrooms share a large Jack and Jill bath with stone surfaces, a double sink vanity and a tub and shower. The lower level is devoted to life’s pleasures, with a home theater, wine cellar and a combination tasting room and cigar lounge. The media room is a custom designed space that is optimized for acoustics and which features wiring for 7.1 surround sound, an 11 foot screen and affordance for any future technological upgrades. Sound traps and insulation have been integrated to create precise audio effects and shield the rest of the house from noise. Raised theater seating ensures a perfect view from every seat. The house occupies a private and nicely sheltered corner of its mature private neighborhood, surrounded by a beautiful combination of natural forest and refined landscaping. It presents a gracious façade to the street with a varied roofline and numerous dormers, as well as a spacious and covered front porch. The exterior is clad in stone and traditional shingles with cedar shake roofing for longevity and easy integration with its surroundings, and the house backs up to lush greenbelt for a sense of enclosure and security. Two oversized garage areas and a fully outfitted shop behind the house make this property a must see for the dedicated collector or maker, with conditioned storage for six vehicles and a professional-level facility for a wide array of craft, construction and restoration projects. Both garages offer extra-height ceilings, integrated water, compressed air and 220 power, while the secondary space has reinforced floors to support a car lift. Substantial storage space has been included above each garage. Finally, the entire property has been constructed with aging in place as a priority. The house is completely autonomous as a single level residence, with the communications and security necessary to provide years of safe and connected living. Stairs are not necessary to access any of the home’s primary living spaces, and the master suite is located on the main level. The entry offers double doors and a gently sloping path with no impediments, and halls and doorways are extra wide to facilitate wheelchair access. This is a wonderful enclave for the multi-generational family or for a luxurious and well supported retirement. Mountainwood maintains a unique and seamless connection with nature. It is located just above the snow line, so it enjoys its own climate and ecosystem, while still maintaining easy access to I-90, the Eastside tech corridor and Seattle. Unspoiled surrounding forestland is habitat for a vast array of wildlife that includes numerous species of birds, deer, elk and rabbits. Patios and sitting areas around the property allow for peaceful relaxation amidst this tremendous natural splendor, be it a soak in the hot tub or roasting marshmallows at the fire pit. Multiple points of the house open out to an expansive attached patio with a covered section for three-season enjoyment. With voluminous space, amazing natural surroundings and every conceivable amenity for luxurious living, Mountainwood is an exceptional estate in the Cascade foothills. It offers a level of planning and construction that is second to none, while creating a magical and supremely private enclave that is perfectly situated between the region’s most stunning natural and urban environments.